Social networks are important part of our lives and lives of our students. Last few years we witnessed that social networks have no intentions to disappear and that we can’t banned them from schools effectively. So let’s embrace them and convert them into powerful tool for learning and teaching. Soc ial networks are risky because lots of students share too much data about themselves, their friend and family and without thinking post naughty messages or even spread hate speech. We have three important topics we have to integrate in our use of social networks in education: protect students’ data, warn students about oversharing and prevent cyberbullying. All of mentioned were reasons I decide to give a chance to Yam mer as safe learning environment. 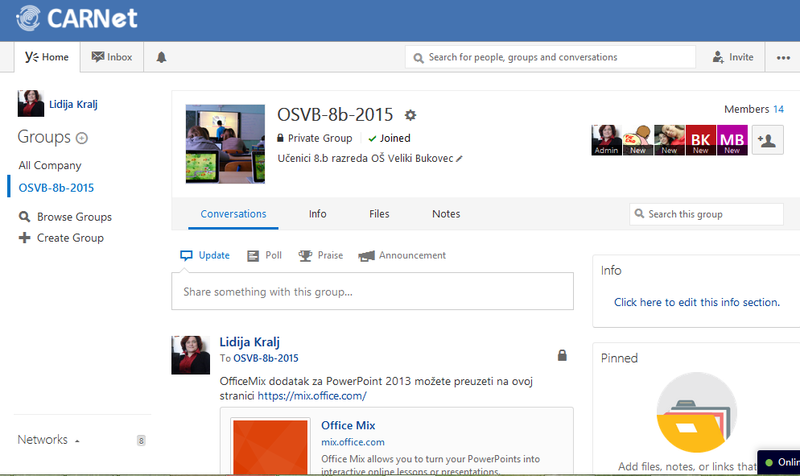 In Croatia we have great opportunity since Office 365, including Yammer is freely available to all teachers and students in primary and secondary schools. We all have digital identity defined on national level with domain @skole.hr, so every person is easily recognizable by their AAI identity (authentication and authorisation infrastructure). Therefore Yammer is open only to persons with @skole.hr identity which makes it safe place for students, even if they are minors. Well it could be a little chaotic when you enter room which is open to around half million teachers and students. So next step was to organize students in private group dedicated to our class only. First students I invited to group but in next few hours they discovered how to find group and ask to join us. One more argument on the side that I have to use social network in class – it’s become kids’ natural environment. Having group just for hanging and talking is not enough for me and not enough to reach some educational goals. I started with topics connected with our current math curriculum – transformations in geometry. 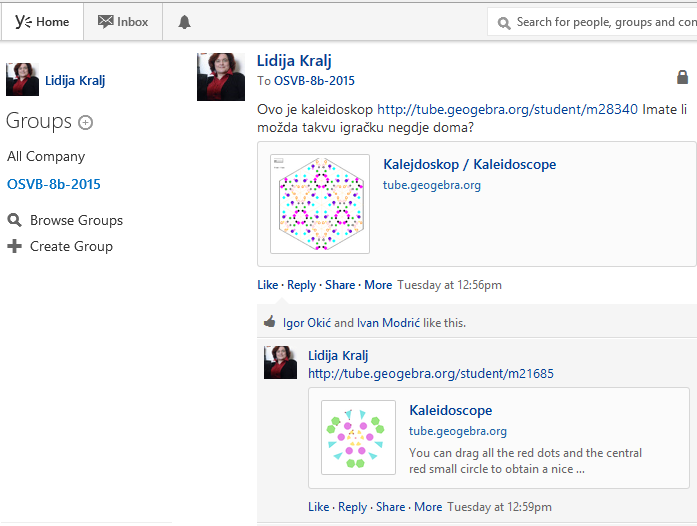 I shared with them few resources about kaleidoscope in GeoGebra and asked them to search for kaleidoscope toy at home. Kaleidoscope is pretty rare today and creating digital interactive version is interesting to students, also they could connect with their parents and grandparents talking about old toy. We’ll see if they come up with some real toys or we’ll just play with digital version. 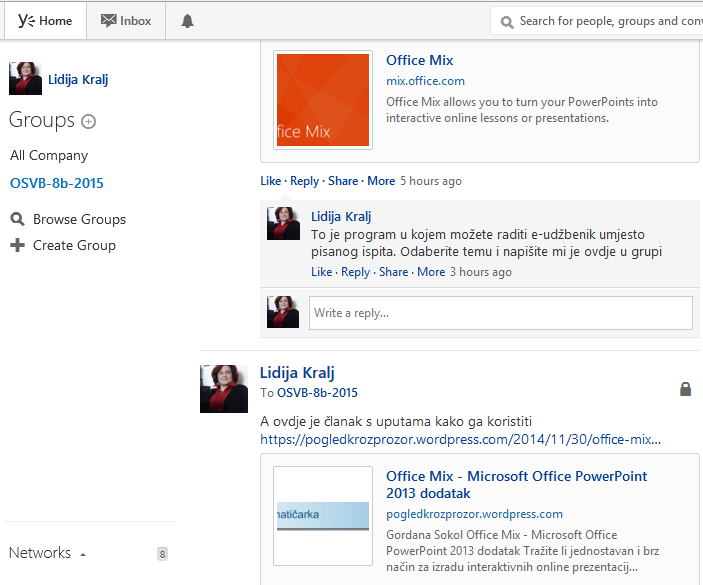 Next post was sharing resources about Office Mix, how to install it and where they could find more information in Croatian. During next few months they will use Office Mix to create e-books about math topic connected with our curriculum. We will use Yammer to talk about process of creation, hopefully solve some problems and later on happily share results. 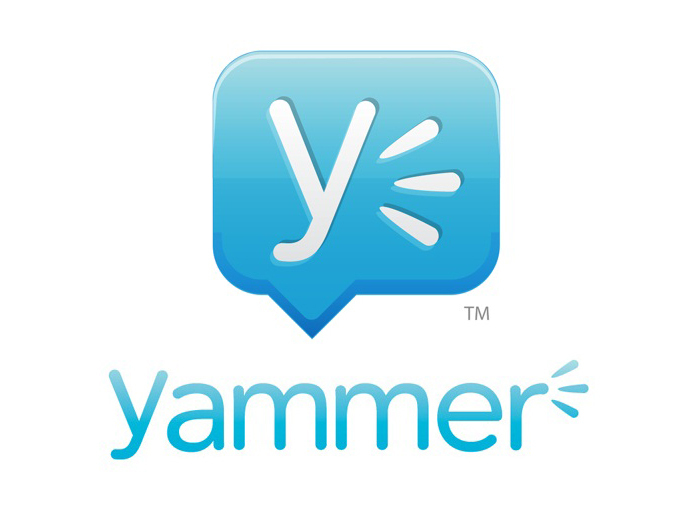 So far Yammer proved to be easy for use, efficient for sharing resources and connecting people. We’ll see what next weeks brings to us but I hope we just maid first step of exciting learning trip. Ovaj unos je objavljen u Uncategorized i označen sa mieexpert15. Bookmarkirajte stalnu vezu.